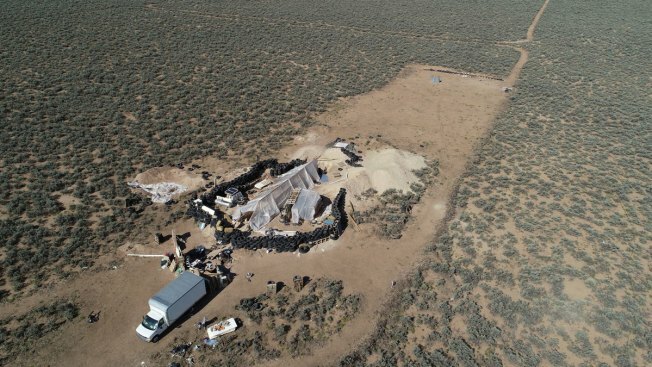 This Aug. 10, 2018, file photo shows a makeshift compound in the desert area of Amalia, N.M. The father of a 3-year-old boy found dead in a filthy New Mexico compound and his partner pleaded not guilty Wednesday to new charges of child abuse resulting in death after lesser charges were dismissed against them and other members of their extended family as the result of a deadline missed by prosecutors. The dead boy's father, Siraj Ibn Wahhaj, and his partner Jany Leveille remained silent as pleas were entered by a judge on their behalf. The charges could carry life sentences in the death of Abdul-ghani Wahhaj. Their pleas came after a judge dismissed child neglect charges filed against them earlier this month. Another judge made the same decision involving three other defendants earlier in the day. District Judge Jeff McElroy criticized the office of Taos District Attorney Donald Gallegos for how the charges have been handled, citing a "complete failure to follow procedures in prosecuting the case." Defense attorneys had pointed out that prosecutors failed to schedule a preliminary hearing within 10 days of the arrests. The suspected child abductor found last week with 11 children and four other adults at a squalid New Mexico compound had trained at least one of the minors to use an assault rifle in preparation for a school shooting, prosecutors said in court documents filed on Wednesday. The children, who officials have said were between the ages of 1 and 15, were taken to the compound by some adults for the purpose of receiving weapons training for future acts of violence, the documents said. "It's difficult I'm sure for the public to understand why this has to happen this way," he said. "It's not the court making this decision, it's the decision of the district attorney to not seek a hearing in the time required by the rule." The Taos County Sheriff's Office confirmed the three were allowed to leave jail late Wednesday afternoon. All five were arrested at a remote desert compound where 11 children were found living in filth. A subsequent search led to the discovery of the dead 3-year-old boy. Authorities say Wahhaj and Leveille denied the boy proper medicine and health care before he died in December 2017 during a religious ritual aimed at casting out demonic spirits. The exact cause and manner of death has not been determined. Prosecutors had pressed to keep all five behind bars and planned to present new evidence of an anti-government plot and talk of jihad and martyrdom among some members of the extended Muslim family. Defense attorneys say their clients have no record of criminal convictions and pose no risk to the public. Federal immigration authorities say Leveille, a native of Haiti, has been in the United States unlawfully for 20 years after overstaying a visitor visa. Police found children living in filthy conditions in a compound in New Mexico. The kids had rags for clothing and very little food or water. Siraj Ibn Wahhaj and Leveille will remain jailed at least until a hearing next week. Prosecutor John Lovelace declined to comment on how the district attorney's office will proceed on the three who were released. Prosecutors have other options for pursuing charges, including seeking indictments from a grand jury. Prosecutors said in court filings they discovered a hand-written document called "Phases of a Terrorist Attack" that was seized from the compound and includes vague instructions for "the one-time terrorist" and mentioned an unnamed place called "the ideal attack site." Prosecutors wrote in court filings that new interviews with some of the children removed from the compound revealed that one of the adults, Lucas Morton, stated he wished to die in jihad as a martyr and that Leveille and Subhannah Wahhaj joked about dying in jihad. Morton, as well as Subhannah and Hujrah Wahhaj, had their charges dismissed Wednesday. The upgraded charges of child abuse resulting in death against Siraj Ibn Wahhaj and Leveille are tied to an extensive account of Abdul-ghani's death in a journal that prosecutors attribute to Leveille. Thomas Clark, the attorney for Siraj Ibn Wahhaj, said court filings against his client have unfairly delved into accusations unrelated to charges of child abuse or neglect. "It's ancillary, inflammatory information that has no bearing on whether or not my client either intentionally or recklessly allowed this child to die from lack of medication," Clark said. In court filings submitted Wednesday immediately before the hearings, Taos-based District Attorney Donald Gallegos renewed accusations that Wahhaj and Leveille represented a danger to the public and requested they be jailed without bail pending trial. The filings describe the couple's involvement in "bizarre cult practices" and described evidence that compound residents were conducting firearms training "to conduct future acts of violence against individuals and civic institutions." Judge Jeff McElroy took the unusual step of urging the general public to wait for the court to vet accusations from law enforcement and prosecutors before reacting, saying he was disturbed by threats of violence against another state judge who previously agreed to release the five defendants on house arrest. "I urge everyone not to react to solely the information contained within the warrants that were filed but rather to the evidence as it gets developed in this case," he said. The boy's mother initially reported him missing last year from Jonesboro, Georgia, after Siraj Ibn Wahhaj said he was taking the child to a park and didn't return. Forensic medical investigators have not yet identified the cause and manner of the boy's death.